We are once again asking the Vacation Bible Schools across our denomination to give their offerings to help support Caleb’s Dollar Ministry, to provide aid and feed the children in our schools in other countries. 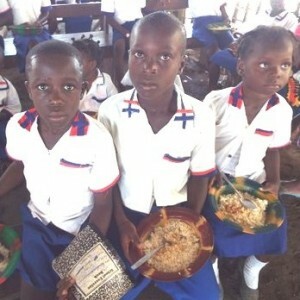 For many of the children, it is the only meal they receive each day. We know how other projects are attrac-tive, but without food hunger returns. This is a ministry that must have consistency year after year. We are, therefore, asking each Vacation Bible School to make this your project for 2018, and for the years to follow. Each meal only cost 10¢, but for the dear children who receive the meals, it is a blessing beyond words. We are currently providing meals for 1,407 children each day in our Christian Schools in Liberia, West Africa, at a cost of $140 per day. This amounts to 7,035 meals per week at a cost of $704. Please share this with the Vacation Bible School Director in your local church and encourage them to adopt this as a permanent yearly project. The kids will be blessed and so will the churches. Thank you on be-half of the children. If you have never been to Africa you might not clearly understand the level of impact your gift and support towards Caleb’s Dollar Ministry is making in the lives of many kids. Imagine a kid being fed once a day. This feeding might take place somewhere around 6 or 7 pm, when daddy or mama returns home from the hustle of trying to find food for the family. Such a life has led many kids to the street, trying to also fight and fend for themselves, thereby abandoning school and damaging their future. In Africa, the supper meal is the only meal available. No breakfast, no lunch, only supper, and sometimes even supper is not available. I lived most of my youth age growing up in such conditions. My dad lost his job because of his refusal to get into politics. We could hardly find food. Imagine us eating leftovers from restaurants. I remembered many days as kids, we went to the forest to find wild fruits to eat because we were hungry. Therefore, when I see kids in this very same condition, that empathy takes over, because I have been there myself. One might actually just see kids, but when I look at them, I see future leaders; I see families. You are helping future leaders and families. Words are limited in describing what your gifts are doing here in Africa. Because of your support to this ministry, we now have kids who once had no hope, now enrolling in our schools to acquire education but not only that, they are also being fed everyday. That means not only are we imparting knowledge, we are also helping families. Before daddy or mommy return home to provide supper, the kids have already had their first meal and seated at home. We are saving lives, saving Africa’s future, and Kingdom citizens.